As much as I promote the idea of simplicity in the foods that I make (for my classes, myself and my clients), every now and then I find that I have to learn this lesson all over again. My goal is always to make foods that taste like themselves...to through the preparation process enhance the innate charms of the featured ingredients...not cover them up. Most of the time, a lot of different additions and seasonings aren't necessary to accomplish this. 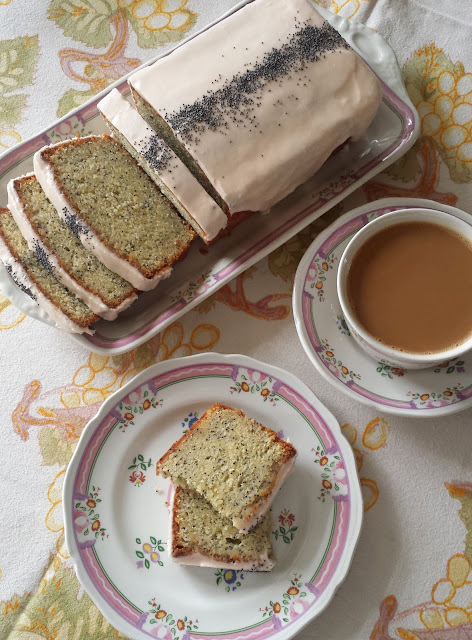 It is true that a multitude of ingredients—when combined with knowledge—can produce flavors of mysterious and delicious subtlety...but more often than not, extreme complexity masks flavor. 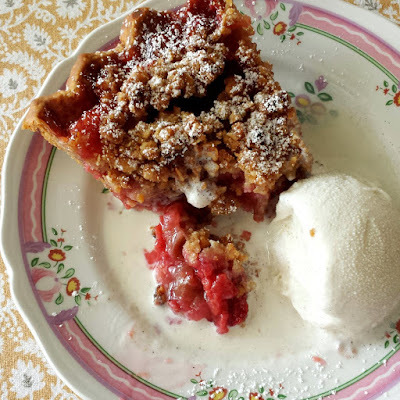 A few years ago I posted a rhubarb pie with an interesting streusel featuring the spices typically found in chai spice. In this particular case, complexity was my friend and the pie was delicious. The walnuts and spices combined with the rhubarb produced a harmonious and memorable whole. I thought adding some raspberries to the mix would only make it better. I was wrong. The new pie tasted of nothing. It was sort of sweet...sort of tart...sort of spicy... But there was just too much going on...too much vying for dominance. As is often the case when something like this happens, I made the mistake of thinking I needed to add something to wake up the flavor. 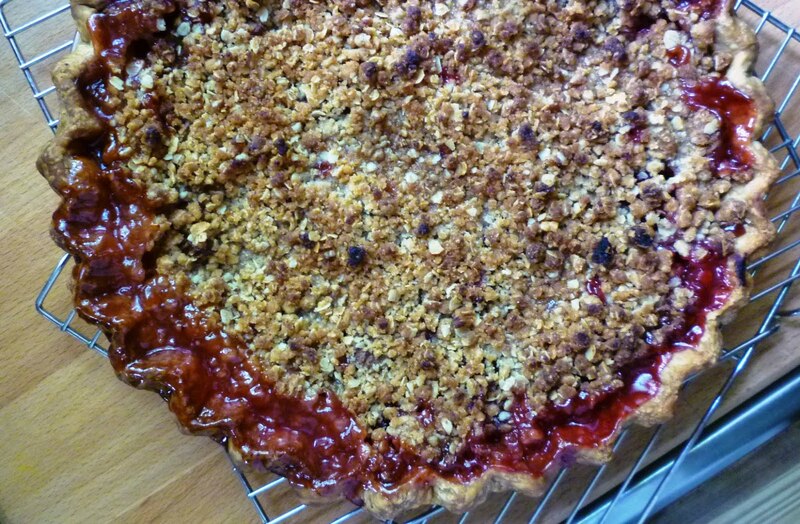 Since most fruit pies benefit (particularly berry pies) from a little lemon, I added that. But because of the other strong flavors it still didn't have the clean fruit flavor that is the hallmark of a fine fruit pie. I then got rid of all the spices but one (cardamom—knowing I liked this with raspberry) and changed the slightly bitter walnuts for sweeter almonds (a friend to both raspberry and cardamom). I also increased the lemon juice in the filling. 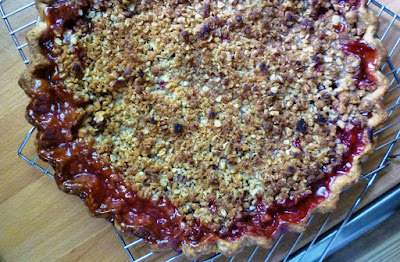 At this point, the filling was much better (sweet-tart and fruity)...but the streusel was still out of place...calling attention to itself rather than supporting the delicious raspberry and rhubarb filling. It was then that I realized that I needed to back up. So I made a simple oatmeal and brown sugar streusel (with no spices)...and added lemon zest and a little vanilla in the filling. 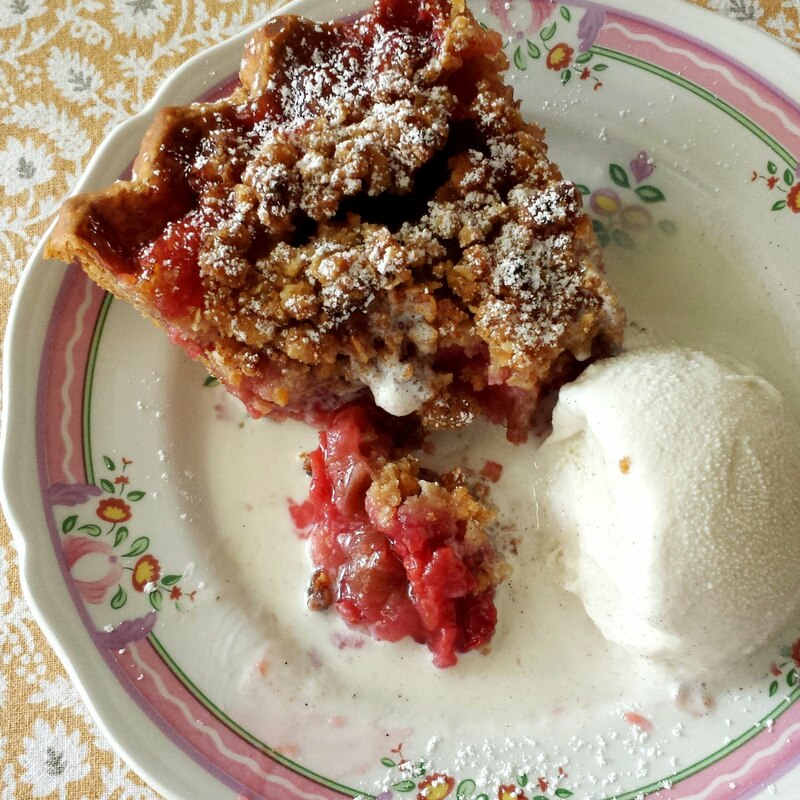 Finally, my pie tasted like what it was...delicious fruit in a tender crust with a sweet and crunchy topping. Combine the dry ingredients for the streusel in a medium bowl. Add the butter and stir with a fork or rubber spatula until the mixture resembles coarse crumbs; chill. Preheat the oven to 425°. Split the vanilla pod and scrape the seeds into the sugar in a small bowl. (Reserve the pod for another use, if you like.) Add the lemon zest. Rub the vanilla and lemon zest into the sugar with your fingers. Add the salt and cornstarch and stir to distribute. Place the rhubarb and lemon juice in a large bowl. Add the dry ingredients and stir until moistened. 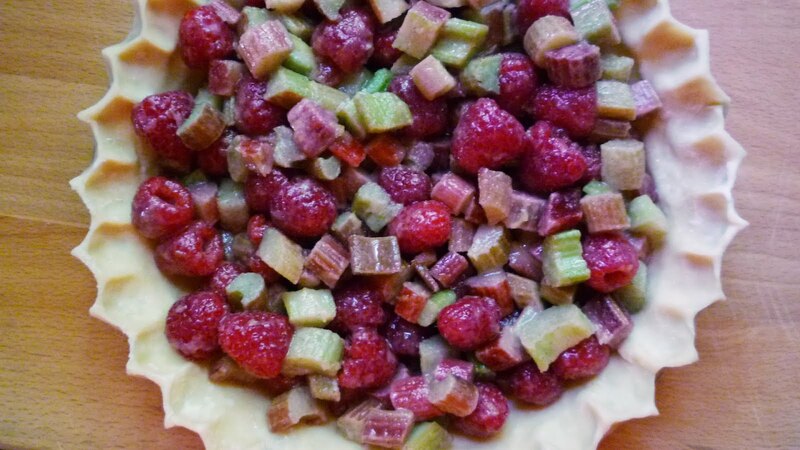 Add the raspberries and gently fold in. Turn the fruit into the chilled crust, scraping the bowl well. Spread the streusel evenly over the fruit. Transfer the pie to the lowest rack of the oven. Bake the pie at 425° for 20 minutes. Cover the edges with a foil ring and turn the temperature down to 375° and bake for 20 minutes. 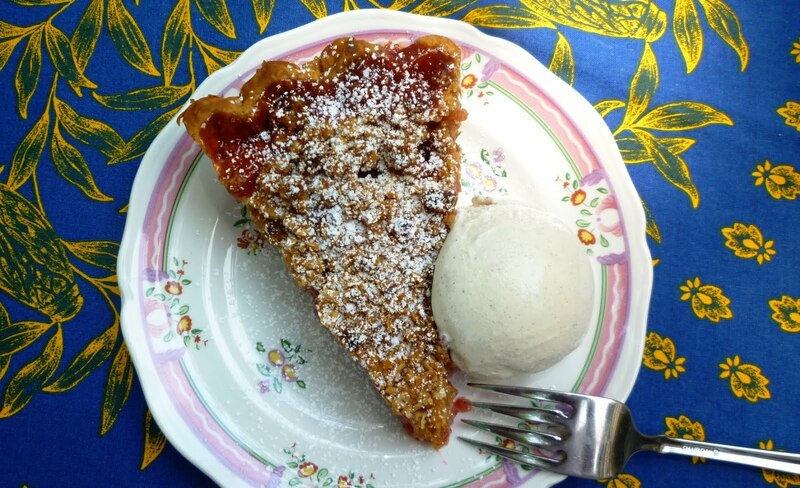 Turn the temperature down to 325° and bake until the streusel is golden brown, the juices are bubbling thickly in the center of the pie and the bottom crust is browned—another 25-35 minutes. 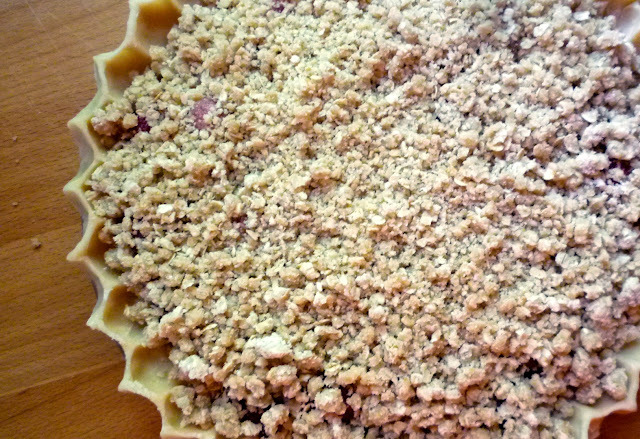 If the juices ever threaten to over-flow, slide a baking sheet under the baking pie. Cool the pie to room temperature before cutting (this allows the juices to “firm up”). If desired, re-warm the pie briefly just before cutting. Serve with vanilla ice cream or sweetened whipped cream. 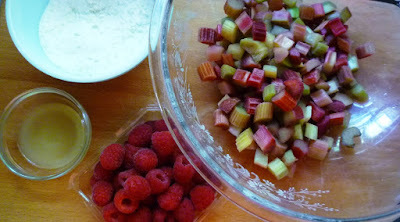 If fresh rhubarb is unavailable, you may use frozen. Spread on a rack set over a baking sheet and let sit at room temperature until just beginning to thaw (it should feel a bit soft)—about 30 to 40 minutes. If any of the chunks of rhubarb are very large, cut them down to an appropriate size. Mix the filling and fill the crust as for fresh. Leave the oven temperature at 425° for 25 minutes. You will have to bake the pie longer at 325° longer before you see bubbles at the center of the pie...perhaps 10 to 15 minutes longer. 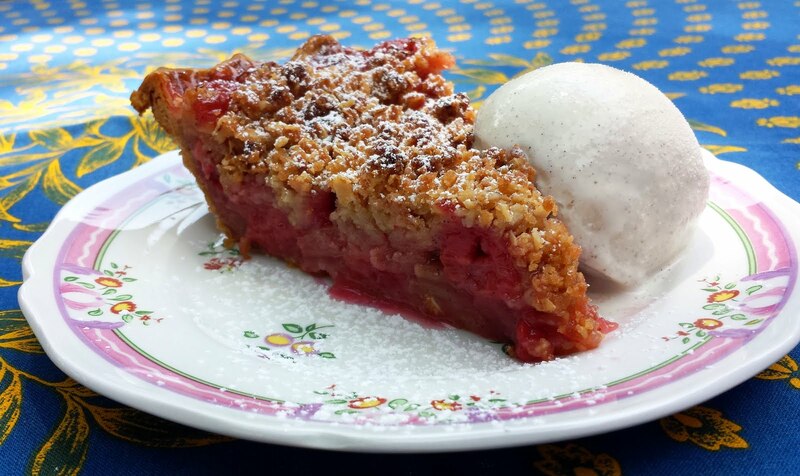 If you prefer your rhubarb to be more heavily sweetened, you may add another 2 T. of sugar to the filling. Don't reduce the lemon juice, the pie will lose its bright flavor. You may leave the vanilla bean out...or substitute a teaspoon of vanilla extract. Add with the lemon juice. Combine the flour and the salt in a medium-sized bowl. Rub the butter into the flour until the mixture looks like cornmeal and peas. Add the shortening and quickly rub in. Drizzle 3 T. ice water over the flour/butter mixture. Using your hands, fluff the mixture until it begins to clump, adding more water if necessary. If, when you squeeze some of the mixture it holds together, the dough is finished. Turn the dough out onto a counter and form into a mound. Using the heel of your hand, gradually push all of the dough away from you in short forward strokes, flattening out the lumps. Continue until all of the dough is flat. Using a bench scraper, scrape the dough off the counter, forming it into a single clump as you do. Wrap in plastic wrap and press into a thick disk. Chill for at least 30 minutes. To roll out, let the dough warm up for a moment or two. Butter and flour a 9-inch pie plate and set it aside. Flour the work surface and the rolling pin. Begin rolling from the center of the dough outward. After each stroke, rotate the dough a quarter turn—always making sure that there is sufficient flour to keep the dough from sticking. Keep rolling and turning until you have a round of dough that is about 1/8 to 1/6 –inch in thickness. Using a lid or an upside-down bowl, trim the dough to form a 13-inch circle. Brush off the excess flour and fold the dough circle in half. Slide the outspread fingers of both hands under the dough and gently lift it and transfer it to the prepared pie plate. Unfold the dough and ease it into the pan being careful not to stretch it. Fold the extra dough under along the rim of the pan so that it is double in thickness. Crimp the edge. Chill the pie shell for at least 1/2 hour. Note: You may replace the vegetable shortening with butter for an all butter crust.